Bleached branching coral in foreground with healthy coral beyond, Great Barrier Reef, Australia. Coral bleaching is the reduction of intracellular endosymbionts in living coral reefs either via loss or expulsion of algal pigmentation. The symbiotic relationship between coral and zooxanthellae is directly related to coral bleaching. When this relationship fails, and the zooxanthellae do not receive required inputs from the coral or vice-versa, the zooxanthellae will pale and turn white or be expelled into the water. The resultant decline in coral health from bleaching is deleterious to the coral ecosystem. Chief drivers for coral bleaching are freshwater dilution, change in pH, marine water pollution, increase in sunlight or alteration of seawater temperature. Particularly widespread water pollution is in the form of marine sedimentation from excessive runoff and discharge of untreated sewage. In addition to these abiotic causes of coral bleaching, the phenomenon of overfishing (particularly in the form of zooplankton loss) is a cause of coral bleaching. Although coral polyps are capable of capturing their own food, the plankton that is ingested does not provide enough energy to the coral. To get the necessary amount of energy, the corals have created a symbiotic relationship with a dinoflagellate called zooxanthellae. Zooxanthellae are single-celled algae that are photosynthetic organisms, and they give part of their nutrient products to the corals in this beneficial relationship. In exchange, the corals provide the zooxanthellae with a protected environment. They also keep the zooxanthellae in the photic zone so they can continue photosynthesis. In many coral species, zooxanthellae are located within small sacs inside the coral polyp's tentacles. In many instances, little bumps can be observed on the tentacles of the coral. These bumps are the outward expressions of the zooxanthellae sacs. Many important aspects of a healthy life are exchanged during this symbiotic relationship. The corals receive energy from the fixed carbon compounds resulting from the zooxanthellae's photosynthesis. Zooxanthellae also aid the corals in calcification, which creates their calcium carbonate skeleton. Zooxanthellae are also responsible for the brilliant colors of the different coral species. The tissues of the coral polyps are naturally clear, but the bright colors of the zooxanthellae shows through and are visible to the human eye. Therefore, it is actually the zooxanthellae that are responsible for the beautiful colors of the reef. As mentioned earlier, the corals provide protection to the zooxanthellae. They also provide a steady supply of carbon dioxide, which the zooxanthellae utilize for photosynthesis. By living within the coral, the zooxanthellae ensure that they remain in the photic zone and they receive a constant supply of sunlight. The symbiotic relationship between coral and zooxanthellae is directly related to coral bleaching. When this relationship fails, and the zooxanthellae do not receive what it needs from the coral or vice-versa, the zooxanthellae will pale and turn white or be expelled into the water. 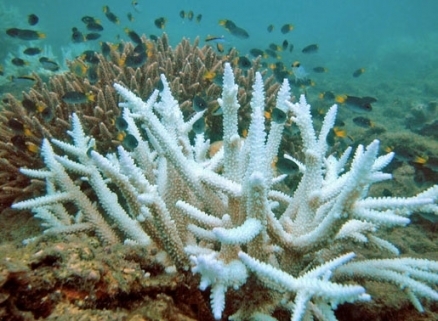 The bleaching, or white color of the coral, is due one of two reasons. First there can be a decrease in the density of the zooxanthellae within the coral, which results from the expelling of zooxanthellae by the coral polyps. Bleaching usually occurs when the coral loses 60-90% of their symbiotic zooxanthellae in their tissues. Bleaching may also occur due to a decrease in the concentrations of photosynthetic pigments within the zooxanthellae, which means the zooxanthellae would express less color making the coral look white. When the zooxanthellae lose 50-80% of their pigments, they turn white. If the coral or the zooxanthellae experience stressful conditions, it will put a strain on their symbiotic relationship. Too much stress outside of certain tolerance zones causes an excess strain on the organisms, and coral bleaching occurs. Factors that stress the coral and affect the zooxanthellae living inside them include freshwater dilution, sedimentation, subaerial exposure, solar irradiance, and temperature. Freshwater dilution and sedimentation are related to local environment degradation and overexploitation, so coral bleaching due to these factors is limited to certain small areas. However, solar irradiance and especially temperature are stressors that cause coral bleaching on a global scale. Since solar irradiance and temperature tend to cause the most damage to coral reefs, these are the main stressors that scientists focus on for global coral bleaching events. The first of the main stressors, solar irradiance, is defined as the incident flux of radiant energy per unit area from sunlight. Bleaching due to solar irradiance is most often observed during the summer months when there are clear skies, calm seas, and low turbidity. These conditions favor localized heating and high penetration of ultraviolet radiation. Although ultraviolet radiation is the most common wavelength of light that causes coral bleaching, photosynthetically active radiation has also been implicated in minor bleaching events. Therefore, there is a wide range of solar radiation that can potentially affect these corals in a negative way. The recent thinning of the ozone layer, or ozone depletion, has caused extra high penetration of UV light. Since there is more UV radiation striking the Earth's surface, this increases the stress on corals, and therefore increases coral bleaching. The second and main stressor of corals is increased temperatures of the oceans. Since corals live within a narrow temperature margin, elevated seawater temperatures of just 1 to 2 degrees Celsius can induce coral bleaching. If the temperatures rise for only a few days, a portion of the zooxanthellae will be expelled from the coral and some bleaching will be seen, but the zooxanthellae will return to the coral when temperatures return to normal as long as the coral remains alive. However, if the increasing temperatures persist for 5 to 10 weeks during the already hot summer months, the corals will expel the zooxanthellae and most likely die from overheating and a decrease in their energy supply. These same behaviors are seen when there is a decrease in temperatures also. As a short term trend, however, the oceans have been increasing in temperature and remaining there for a longer period of time. This phenomenon is placing great amounts of stress on the corals, causing epidemic coral bleaching and coral death. Since global warming is a contributor of alteration of water temperatures, it is also a cause of coral bleaching today. The future of coral reefs is bleak to say the least. If ozone depletion and global warming trends continue at their present rate, we can definitely expect to see an increase in the frequency, severity, and scale of coral bleaching. If the ocean temperature around 20-30 degrees N latitude increases only one to two degrees Celsius. This effect could contribute to extinction in coral species in this region. It is also most likely that coral species that live in shallow reef zones will be the first to become extinct because they are closest to the UV radiation and heat. K.R.N.Anthony and A.P.Kerswell. 2007. Coral mortality following extreme low tides and high solar radiation. Marine Ecology Progress Series 151(5): 1623–1631. R.J.Jones, J. Muller, D.Haynes and U.Schrieber. 2003. Effects of herbicides diuron and atrazine on corals of the Great Barrier Reef, Australia Marine Ecology Progress Series 251: 153–167. K.P.Sutherland, J.Porter and C.Torres. 2004. Disease and Immunity in Caribbean and Indo-pacific Zooxanthellate Corals. Marine Ecology Progress Series 266: 273–302. T.Saxby, W.C.Dennison and O.Hoegh-Guldberg. 2003. Photosynthetic responses of the coral Montipora digitata to cold temperature stress. Marine Ecology Progress Series 248: 85. McGinley, M. (2014). Coral bleaching.